I saw a post recently in the MSDN SSIS forum asking for help to build a package to loop through the rows of a ‘Header’ table. Then for each ‘Header’ row; get rows from ‘Line’ table and then import them into an Excel file, this is, generating a different Excel file for each Header-lines set. For the sake of simplicity, I decided to divide the solution in two parts. This first part explains how to use a ForEach Loop Container to iterate through a result set retrieved by a query. Then Second part shows how to use Excel Destination to create files dynamically. 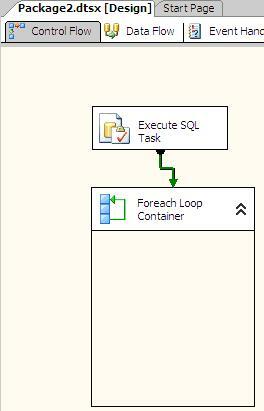 In an empty package, add a Execute SQL Task and a ForeachLoop Container. 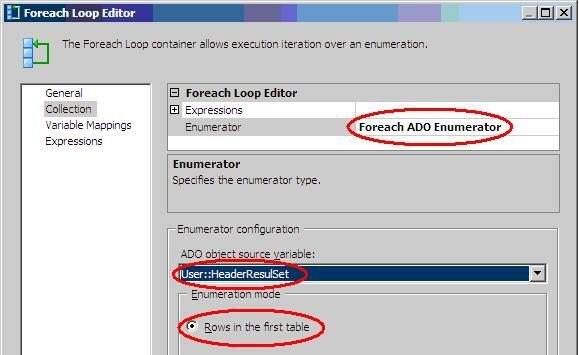 The Execute SQL Task is used to get the ‘Header’ set of rows that will drive the ForEach loop container. 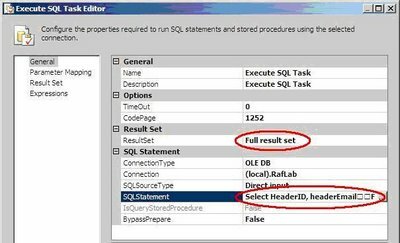 Then create a SSIS variable of ‘Object’ type to hold the result set from the Execute SQL Task, in this example I called it ‘HeaderResultSet’. Also create one variable for each column in the ‘Header’ result set you are planning to use. In this case I have added one for the HeaderId and other for the HeaderEmail column. 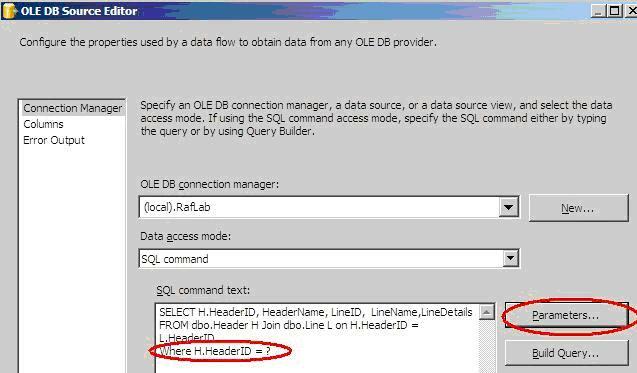 Open the Execute SQL Task and write the SQL Statement to query the Header table, change the ‘ResultSet’ property to ‘Full Result Set’. The connection property obviously has to point to the database where you created the sample tables, therefore make sure you create a connection manager for that. In the ResultSet tab, select the variable that will hold the query result and click OK. So far, we have configured the Execute SQL Task to retrieve a set of rows from the ‘Header’ table and place the result into a SSIS variable called ‘HeaderResultSet’. Now, add a DataFlow task inside of the ForEachLoop. Once the query is in place, it is time to map its parameter. Click in the parameters button and create the required mapping. In this case, the variable HeaderID, that is populated by the ForEachLoop container, is mapped to the HeaderID column in the WHERE clause of the query. Click OK when you finish. 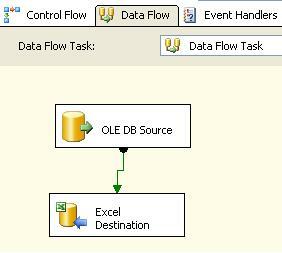 Now, back to the data flow, add an Excel Destination component and connect the OLE DB Source output to it. Then, open the Excel destination and create the connection manager and the excel sheet using the new buttons. For this example, the default selections should work just fine. Notice that when you use the new button to create the Excel Sheet a create table statement is issued against the Excel workbook to actually create a sheet. This would be used again when building the logic to make a ‘Dynamic’ Excel destination. At this point, you should be able to execute the package and get all the rows into a single Excel file; which is half of our ultimate goal. If you are still interested in the other half of the article and learn how to make a Dynamic Excel Destination, just check it out here. Awesome post.. Thanks for the help Rafeal..!! any ideas of doing the same with a text file? coz the text file does not have column based structure.. This is very useful, thank you. 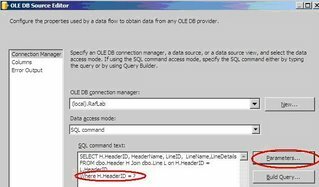 One question: HeaderEmail is selected as a column in the initial Execute SQL Task and a variable for HeaderEmail is declared, but as far as I can tell it's not used for anything. Is this an oversight or am I missing something (the latter is completely probable). I lied, two questions: if I attempt to execute the package a second time (because the source data has changed and I want to update/overwrite these documents) I receive the error "Table 'Excel Destination' already exists." How might I modify this package so that it would overwrite an existing document? Same concept would apply for Flat File destinations; you need to use expressions in the Flat file connection manager to create a new file on each iteration. You are right I am not using HeaderEmail after the first Execute SQL task. That is a bad practice as you should get rid of the unused columns/rows. Good catch! It's really a good practice about parameter and for loop. I'm encountering the AS400 extraction issue. I need to create alias for the files with multi-members. I read another post (http://rafael-salas.blogspot.com/2007/11/ssis-mapping-parameter-inside-of.html) and create the following parameter. "CREATE ALIAS QGPL.MBAL" + @[user::Var1] +" FOR XXXXLIB.XXXMBAL(" + @[user::Var1] + ")". I'd like to know how th pass the resultset & parameter from foreach container to the create alias parameter. I've done the extraction from multi-members on AS400 to SQL Server 2005 DB through SSIS successfully. The key components are "Foreach loop" and parameterized SQL command. Really thanks for the marvelous post. Hello Rafeal... Any idea how to delete an existing worksheet..? Thank you for this article, you've helped me do exactly what I wanted. Hi Raef - brilliant article however do you know if there is a way to create a SQL table in an existing database from an excel spreadsheet. For instance the spreadsheet I receive has different headers each week (w/e headers) so I want to create a new staging table each time. Do you know if this can be done? Hello Rafael, I am working on a similar concept where I need to copy the data from multiple tables on one db to another db (both databases are on different servers). I tried creating an execute sql task and getting the list of tables and assign it to a variable and passing it to for each loop container but I ma having trouble defining destination. Could you please guide me.